LankaWeb – Is Syria part of a return to days of the Christian Crusades? Is Syria part of a return to days of the Christian Crusades? Why is it that when Western states, majority of whom are avid Christianity following countries never mention or purposely omit mentioning the Christian aspect to a conflict though the same states & their media channels go overboard in attacking other countries tagging religion to it? News coverage on Sri Lanka is full throttle anti-Buddhist and so too is coverage of news in Myanmar, same when stories emerge against Hindu India and Islam. Look at the numbers of mainstream media & even face book accounts that are Anti-Islam by Westerners but only when a non-Westerner puts a similar anti-Islam post does the news go right up to the UN & leads to condemnation by the entire world. What kind of hypocrisy is this? Hypocrisies are many & people must also know their history enough to understand that there is a historical background to the aggression & revenge that shrouds the West’s action against Syria. The Western nations today preaching human rights and freedoms were the very nations that denied people human rights & freedoms when they saw fit to take sail to ‘discover’ nations that were already discovered & inhabited but were ordered by the Church through Papal Bulls to declare them Christian & Missionaries sent to forcefully convert or kill those that refused. If anyone challenges this they are first advised to look up every country that Spain, Portugal, Britain, France invaded, occupied & converted and the horrific crimes they committed to the innocent people of these territories in particular the Inquisitions which mirrors the present UNHRC & ICC determinations against only non-whites or enemies. Not stopping there, they even disenfranchised these natives and today they sing a national anthem with their hands across their hearts clueless the nation they are proud of was stolen from the natives that lived there! These Western nations demanding justice, retribution for crimes committed & accountability refuses to even acknowledge or account for the crimes they committed upon every country they invaded, occupied & plundered. If these Western countries refuses to atone for their sins what right do they have to demand other countries should be punished only. After all, they are suffering & dealing with the evils these colonials planted and left as a result of their divide & rule policies. The countries that ridicule Dharmic religions completely ignore that it was the Pope that bade calls to take up arms for the 1st crusade & it was the expansionist ideology that created foot soldiers in Christianity & Islam & this is how Christianity & Islam spread to cover more than half of the world populace. There have been no wars to defend Buddhism. It is Islam & Christianity that have been in competition to dominate. Is it to show their religious superiority or to simply grab territory & control people & resources? There have been 8 Crusades fought against Muslims for the Holy Lands between 1096 and 1270 C.E. Crusade comes from the latin word cross, and the crusaders were defenders of the cross wearing uniforms with symbols of the cross of Christ with shields painted with crosses and no different to how the West pursues its military interventions in the present. The Knights of Templars still exist inside the Vatican! Pope Urban II’s call to arms in 1095 which led to the first crusade was primarily due to the Muslims cutting off excess to Jerusalem to the Christians no different to the manner the West is now cutting of trade excess routes, creating no fly zones & imposing sanctions. The winners always dictate history as was seen in the outcome of the World Wars & putting on trial only the defeated and much of the history we know as history has been written by Western historians or locals taught history by the West. Not many have seen fit to challenge some of the conclusions derived. Political correctness stops short of that challenge! What is curious is that Islam & Christianity have returned to its birth place & where they first started to spread. Islam starting out in the 7th century spread across Middle East & North Africa, Southern Europe, Central Asia to Sudan, India until Christianity made a comeback in the 11th century. Shiites ruled Egypt & Sunni’s ruled Syria & Iraq. The British role in both Iraq & Syria will doubtless raise eyebrows as to how Britain is continuing its destructive role now. Is the Franks as the Christians were known then the present US, EU & NATO forces? Is Saladin the OIC majority Muslim member states? Is this the showdown we are now returning to. Is the War on Terror a reflection of that Crusade and is the Western slogan ‘You are either with us or with them” having greater meaning & significance? Let it also be known that the West was then undeveloped and the Crusades were attacking urbanized and culturally sophisticated areas. http://siliconafrica.com/terra-nullius/ Europeans did not need to bring any civilising to Africa – Africa is now uncivilised because of the Europeans! Even during those times non-Europeans were shocked that these white people bathed once or twice a year & never washed their clothes and isn’t this the same view people have now with perfumes supplementing for bad odour! Colonial imperialism is no doubt the same with the desire to completely vanquish the cultural & historical heritage of countries that had proud and rich civilizational history that the West hadn’t. Cultural genocide began and continues with the West & even political Islam. Today neocolonialism and using the puppet of the UN both the West & Political Islam are getting away using slogans of political correctness & multiculturalism. Was the destruction of those areas then clothed with the same revenge, jealous mentality that prevails presently in the manner precision bombing by the Western forces directly ordered to destroy centres of cultural heritage and isn’t that what the Western-trained & funded Al Qaeda/ISIS and its co-partners are also doing of late entering museums and destroying ancient artefacts & relics. These incidents require much soul searching and search into the past & analyzing the dynamics that led to forces being ordered to destroy what was others. But to be fair by the Christian West, this is exactly what the Islamic conquerors did when they set off to capture territory that they now claim as theirs – every non-Islamic monument was brought to the ground & replaced with Islamic structures. You cannot find many Hindu monuments in India for this reason. We all know what befell of the world’s oldest library & university at Nalanda when Islamic invaders arrived not only to burn the library but to kill the monks mercilessly as well. The story of the Bamiyan Buddhas too has been the outcome of not just Taliban but many other Islamic leaders trying to destroy it. In essence both these Abrahamic Faiths have proven to destroy others & the planet & be self-destructive by their actions as well. 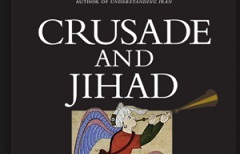 What difference is the Crusades by the Christians & the Islamic Jihad to all those who are victims? Both indulge in cultural colonialism, trade colonialism, faith colonialism. Both forms attempt to rule theirs over others and it is certainly a clash of civilization returning. However, the Muslims defeated the Christians and is this all about avenging the historical loss by the Christian West? Although it must be said that apart from the brainwashed followers of both parties the general public belonging to both faiths are against any form of violence as can be seen by the protests against the US, UK, France & Allied decision to bomb Syria on the pretext of chemical bombs which probably these very countries would have planted to justify their actions. The many fake videos of even children being trained to pretend they were attacked and artists painting blood to show wounded and media happily relaying them to a gullible public shows that the Crusades & Jihad have climaxed to a modern platform but where will all these lies, bombings, destruction & mayhem eventually lead? USA and West are behaving like mad dogs. They have immense problems in their own countries and unable to solve them they divert attention by raising a Syrian ghost. Every thing USA or the west- France, UK, Germany etc; touch end in disaster. They should work with Russia to stop terrorist menace comming from the Middle East. We in Sri Lanka have experience of what the USA and West can do to small countries in order to benefit their political strategies agains China and Russia. Sri Lanka without USA and West would have been a prosperous country by now. But today they the USA and West have worsened communal disunity, and made Sri Lanka poor and politically , commmunally divided than it had never been before the Sirisena Ranil Government supported and advised by USA,West and India. The UNO should be either dissolved or put under the control of a Strong Secretary General if the USA and the West are to be halted from carrying out their manupulation of poor countries for their political benefit. The timing of the bombing was to cover up the tracks on the insistence of Brits. Inspectors were already in Damascus. They wouldn’t have found any chemicals. By bombing the facility, there was nothing to inspect. Bashar Al-Assad has already won the war, the remaining terrorist were packed away. The US, UK and France acted like air force of the terrorists.